Plant & Crop Science Blog: Climate change: will quinoa weather the storm? : Research shows quinoa grows well in diverse conditions, so should more be done to promote it to farmers? Climate change: will quinoa weather the storm? : Research shows quinoa grows well in diverse conditions, so should more be done to promote it to farmers? Mention quinoa, and most people think of South America. The grain has been a staple food in the Andes for thousands of years, with Bolivia and Peru accounting for the vast majority of the 82,510 tonnes produced globally in 2012. But there's no reason why other countries can't grow it too. Highly adaptable, the crop could contribute to food and nutritionsecurity in parts of the world where it has never previously been grown. Speaking at the launch of the 'International Year of Quinoa' last year, UN secretary general Ban Ki-moon described quinoa as being "poised for global recognition", and FAO has used the year to highlight the role that quinoa could play in addressing global malnutrition. Its nutritional profile is comparable to teff, a grass crop, which is currently grown mainly in its native Ethiopa but also has wider potential. And like teff, quinoa is interesting in development terms because of its resilience to different climates. "It has the ability to grow under very difficult conditions," says Sven-Erik Jacobsen, associate professor at the department of plant and environmental sciences at the University of Copenhagen. "If you go to the south of Bolivia, you're 3,600 metres above sea level, with 200mm of rain, and there are 200 nights with frosts. There's only one crop you can grow and that's quinoa, and this is why it has potential for many parts of the world." One research project is currently underway in Malawi, in a partnership between Washington State University and the Lilongwe University of Agriculture and Natural Resources (Luanar), which in turn is working with a small Malawi-based NGO, Total LandCare. The research is evaluating how a number of quinoa varieties perform under both irrigated and rain-fed conditions, and assessing any problems such as pests and diseases. "So far we have seen promising results," says Moses Maliro, associate professor of plant breeding and genetics at Luanar. "Under rain-fed conditions, which are associated with problems and diseases, we managed to get at least two tonnes per hectare of grain for six varieties. When we grew under irrigated conditions, some went as far as three tonnes, so to us those are encouraging results." From April, Luanar will be working with Total LandCare to grow quinoa on three demonstration sites, which will be used to gather data and share learning with 300 households in the area. As well as assessing the best varieties and soil and weather conditions for growing quinoa in Malawi, the demonstration plots will look at how receptive people are to including quinoa in their diets. This is an important part of the work. For FAO too, promoting quinoa is primarily about its role as a subsistence crop and how it can address malnutrition, but to do so successfully it has to be something that people are willing to eat. With quinoa fetching high prices on the world market, consumption has dropped in its native Andean communities as farmers export their crops and local populations can no longer afford it. Boosting production in other parts of the world should mitigate this. 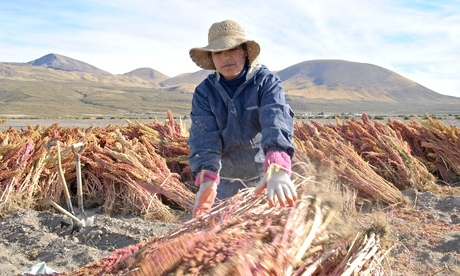 Fortunately for potential quinoa growers, it is not a difficult crop to grow. Hassan Munir, assistant professor in the department of crop physiology at the University of Agriculture in Faisalabad, Pakistan, was the first to introduce quinoa to Pakistan in 2008 as part of his PhD research, and has found farmers receptive to it in his trials. "It's a new crop but farmers are interested, especially the more progressive farmers," he says. "Quinoa is rather an easy crop to grow, and doesn't require specialised skills. It compares favourably to rice and sugarcane. We're in the Indus valley, the world's oldest centre of cultivation, so we already have a variety of cultivation practices. But we face both severe cold and drought, so there's a need to introduce a new climate-resilient crop which can feed our own population as well as potentially serving as a cash crop." Pakistan and Malawi both have high rates of malnutrition, with stunting affecting around half of all children there, according to FAO. Quinoa's high nutritional value could help address that problem in those countries and many others, but it may take time to establish itself. "It's really not yet familiar, so I think first we need to build up knowledge among governments, researchers, and policymakers, so that they can add quinoa to the list of crops for research, and for the extension systems to take it on," says Maliro. "It will take a lot of awareness raising. But policymakers and NGOs really need to become more aware of this crop, and what it could potentially do."